Being a skilled nurse requires more than meets the eye. Nurses are caregivers helping others in their healing processes, and providing that care for another person goes deeper than the many technical skills listed in the job description. Simply put, Nebraska Methodist College believes it is not enough to provide care for a person without truly caring about the person, and this is where Jean Watson’s Theory of Human Caring enters in. Jean Watson is an internationally-recognized nurse theorist and nursing professor. Her Theory of Human Caring is at the foundation of NMC’s BSN program. Freshman nursing students at NMC are introduced to Watson’s theories and teachings in their very first course. From that point on, Watson’s theories are intertwined in each nursing student’s education. Through Watson’s theory, students are taught to care for patients’ all-around wellbeing — their physical health, but also their emotional and spiritual state. According to Nursing Professor Echo Perlman, Watson’s lessons of holistic care are a very important part of what professors teach at NMC’s Nursing Arts Center. 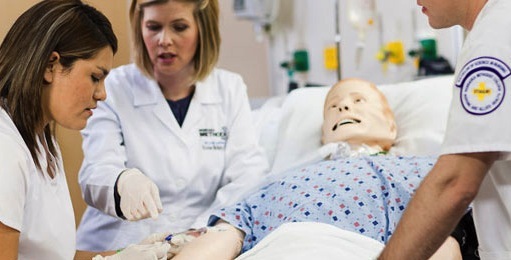 In NMC’s Nursing Arts Center, students practice their skills on a wide array of life-sized anatomical human models or manikins, appropriately named “The Watson Family.” The students practice interacting with the manikins as if they were caring for real people. Students learn how to comfort their patients by holding their hands or making sure they are covered up. This might seem simple enough, but to a patient it creates a healing environment, which is a crucial part of Watson’s theory. A healing environment is a caring atmosphere that allows a patient to recover and develop to his or her full potential. Perlman says students are also taught the importance of caring for themselves. In settings such as hospice for instance, nurses deal with death, dying, and grief. According to Watson’s theory, it’s also important for caregivers themselves to recover and heal before taking on the responsibility of caring for others in order to create the best healing environment possible for their patients. Sustaining humanistic-altruistic values by practicing loving-kindness with self and others. Being authentically present, enabling faith and hope and honoring others. Being sensitive to self and others by cultivating own spiritual practices, beyond ego self to transpersonal self. Developing and sustaining loving, trusting-caring relationships. Allowing for expression of positive and negative feelings — authentically listening to another person's story. Creatively problem-solving through caritas process — full use of self and artistry of caring-healing practices via use of all ways of knowing/being/doing/becoming. Engaging in transpersonal teaching and learning within context of caring relationship. Creating a healing environment at all levels; subtle environment for energetic authentic caring presence. Reverentially assisting with basic needs as sacred acts, touching mind/body/spirit of other; sustaining human dignity. Opening to spiritual, mystery, unknowns- allowing for miracles. For more information about Jean Watson, visit www.watsoncaringscience.org.